Microsoft Corp.’s earnings report and forecast cheered investors, providing further evidence the company can increase cloud sales and squeeze more profit from the area while cutting into Amazon.com Inc.’s massive industry lead. The shares rose to a record. Profit and revenue in the period ended June 30 exceeded analysts’ estimates, as did Microsoft’s projection for cloud sales in the current quarter. Chief Financial Officer Amy Hood pledged that commercial cloud margins would improve overall and for each of the products that make up the area -- Azure, Office 365 and cloud-based customer software. Microsoft’s shares rose as much as 3.6 percent to a record $108.20 in New York Friday. 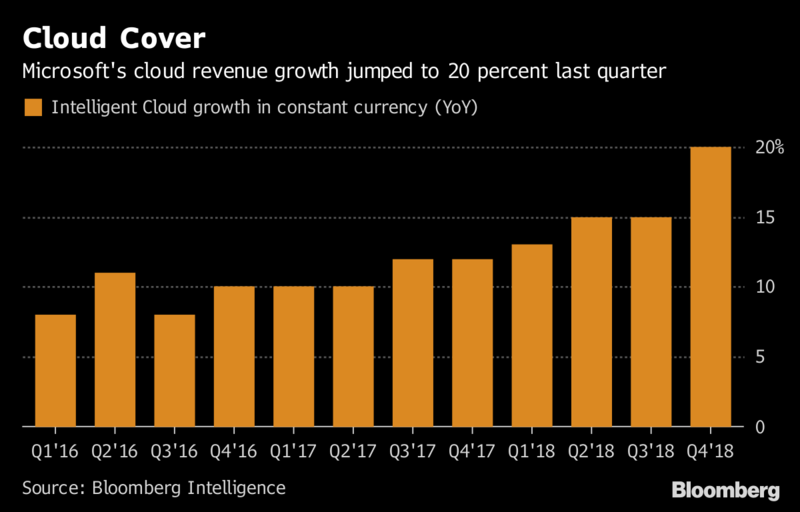 The rally came after Hood unveiled a forecast that envisioned fiscal first-quarter Intelligent Cloud sales of as much as $8.35 billion, compared with an average analyst estimate of $7.95 billion. Even the company’s projection for higher operating expenses and capital spending to build more data centers couldn’t dampen enthusiasm as it was seen as a sign of customer demand for cloud products. Chief Executive Officer Satya Nadella has been overseeing steady growth in the company’s Azure and Office 365 cloud businesses. Surveys of customer chief information officers by both Morgan Stanley and Sanford C. Bernstein published in the past month show an increase in companies signing up for or planning to use Microsoft’s cloud products. Revenue from cloud-computing platform Azure rose 89 percent in the quarter, while sales of web-based Office 365 software to businesses climbed 38 percent. Microsoft also saw a bump from relative improvements in the corporate personal-computer market, which has been stagnant for years. Stock in the Redmond, Washington-based company rose 8 percent during the quarter, exceeding the 2.9 percent increase in the Standard and Poor’s 500 Index. Shares reached records throughout the period, and have continued to move higher since the quarter’s close. Profit rose to $8.87 billion, or $1.14 a share in the fiscal fourth quarter, topping the $1.08 average estimate of analysts polled by Bloomberg. Sales climbed 17 percent to $30.1 billion, Microsoft said Thursday in a statement, higher than predictions for $29.2 billion. Annual sales also topped $100 billion for the first time in company history. Commercial cloud sales rose 53 percent to $6.9 billion, the company said in slides posted on its website. Gross margin for that business widened by 6 percentage points to 58 percent. Microsoft has been posting improved profitability as it adds customers, enabling it to run services more efficiently and spread costs across more clients. With cloud demand rising, Microsoft has also said it will continue to invest. Hood said capital expenditures in the coming fiscal year would increase but at a slowing pace. The company will also boost operating expenses by 7 percent in the fiscal year that started July 1. During the fourth quarter, the company also agreed to acquire code-sharing website GitHub Inc. for $7.5 billion in stock, aimed at accelerating moves into the cloud and artificial intelligence. Microsoft’s tally of multimillion-dollar cloud deals was the highest ever in the recent period, Michael Spencer, general manager of investor relations, said in an interview, without providing specifics. Many of those deals included more than one cloud product, he said. In a Morgan Stanley poll of 100 U.S. and European CIOs, 34 percent of respondents said they planned to buy a more expensive tier of Office 365 software in the next one to two years. Those using or planning to use Azure rose to more than 70 percent. Bernstein found 62 percent of CIOs said they used Azure as of June, up from 50 percent a little more than a year prior. That compares with 60 percent for market leader Amazon Web Services and 23 percent for Google cloud. The most recent survey from Synergy Research Group reported Microsoft gaining share more quickly than Amazon. Still, the latest quarterly jump in Azure revenue decelerated from the 93 percent growth Microsoft posted in the prior period. Market-share surveys generally show Azure lagging far behind Amazon, which is at least three times bigger by that measure. The two companies are adding new cloud services and duking it out for customers as No. 3 U.S. player Google tries to catch up. Earlier this week, Microsoft said Walmart Inc., an Amazon retail rival, signed a five-year cloud deal involving Azure and Office 365. Sales of Intelligent Cloud products -- Azure and server software -- rose 23 percent to $9.61 billion, above the $9.07 billion average estimate of four analysts polled by Bloomberg. Productivity software, mainly Office sales, rose 13 percent to $9.67 billion. That compares with the $9.64 billion average estimate. While Microsoft has reorganized its structure and de-emphasized its Windows PC operating system efforts -- once the company’s flagship business -- corporate sales of the software still generate considerable revenue. That means the company benefited as PC shipments rose last quarter for the first time in six years, owing to strength in the business segment, which helped make up for continued declines among consumers, according to Gartner Inc. In the fourth quarter, revenue in the More Personal Computing unit rose 17 percent to $10.8 billion, compared with a $10.5 billion average estimate. Surface hardware sales rose 25 percent from a year ago, and gaming revenue increased 39 percent, fueled by demand for third-party titles for the Xbox console. Gaming revenue for the full year topped $10 billion for the first time. As the U.S. places tariffs on some foreign goods and countries retaliate with taxes of their own, Microsoft is keeping an eye on the issue, Spencer said.